Meet the four distinguished directors who have each helped grow the Centre for Heart Lung Innovation into the world-leading research centre that it is today. 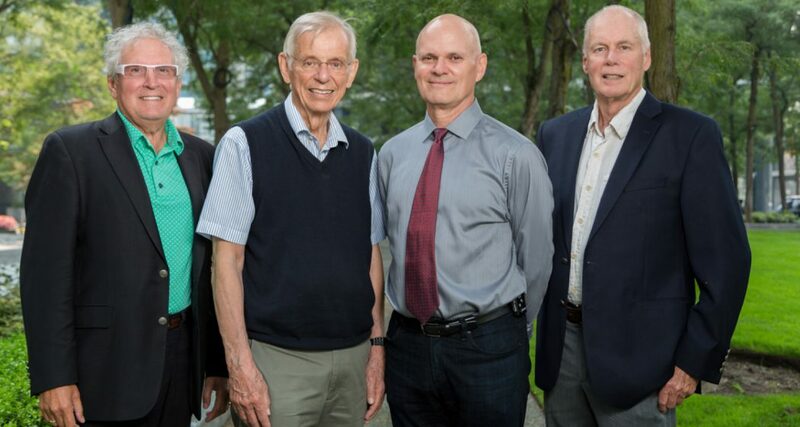 Pictured from left, Dr. Bruce McManus (former director, 2006-2012); Dr. Jim Hogg (co-founder and former director, 1977-1999); Dr. Keith Walley (director, 2013-present); and Dr. Peter Paré (co-founder and former director, 2000-2005). When the Pulmonary Research Laboratory opened at St. Paul’s Hospital in 1977 – with one trainee and two principal investigators on board – who could have known that it would become a world-class research powerhouse for understanding and eliminating heart, lung and critical care disease. But that’s what happened. Now in its 40th year, the Centre for Heart Lung Innovation (HLI), as it’s known today, has plenty to celebrate. Senior investigators are also dedicated to nurturing the next generation of scientists. In the past decade alone, they have hosted more than 600 graduate students and postdoctoral fellows from 39 countries on six continents. “Our commitment to sharing knowledge has resulted in this well-spring of brilliant young people who end up doing amazing things in our own communities and in distant places,” says principal investigator, and former HLI director, Dr. Bruce McManus. Dr. Liam Brunham and his team, for one, are studying early-onset atherosclerotic heart disease, a condition tracking in families that can lead to heart attacks in very young men and women. The goal is to identify genetic and environmental risk factors in families and develop new and more effective ways to diagnose and treat the disease. Dr. Janice Leung is looking at why people with HIV end up with chronic lung diseases more often and at younger ages than the general population. Her aim is to develop targeted treatment and prevention strategies for one of BC’s most vulnerable populations. At the heart of Dr. Mari DeMarco’s research is the growing number of Canadians who will develop Alzheimer’s disease or other forms of dementia. Early diagnosis is critical for improving quality of life for these patients, yet current diagnostic tools lack accuracy. DeMarco wants to change that, creating effective, accessible tools, based on bio-markers in the cerebrospinal fluid.